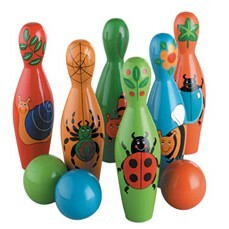 Large Wooden skittles hand painted in bright colours each with it's own mini beast on the front. Line them up and knock them down with the colourful wooden balls. A great game for all the family, play in the house or garden. We love the creepy crawly designs. These skittles are made from sustainable rubber wood and measure 20cm high.